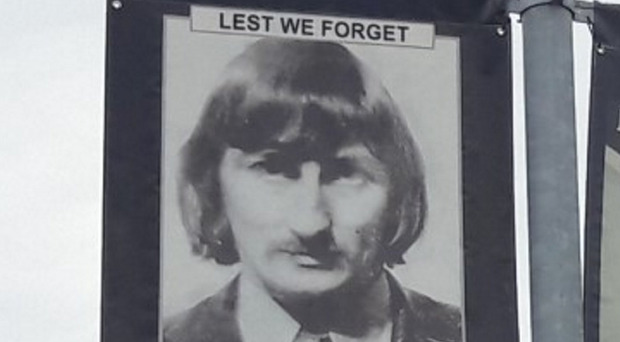 A member of Moygashel Residents' Association has vowed that a controversial banner ­ dedicated to UVF murderer Wesley Somerville will be going back up because "it is what the community wants". Tensions in the loyalist Co Tyrone village are high after a man was arrested for taking down the banner from a lamppost near a primary school. The tribute to Somerville, a member of the UDR and the notorious Glenanne gang, and one of two UVF men who blew themselves up during the Miami Showband massacre in July 1975, was put up beside another UVF banner and UVF flag. Families of Somerville's victims had called on the PSNI to remove it. But it was stolen on Friday and police later said they had arrested a man in his 60s in connection with the incident, who was then released on bail. Victor McNicholl from the Moygashel Residents' Association said that the banner will be going back up as soon as it is returned by police. "The banner commemorating Wesley Somerville has been going up for years, it didn't just appear recently," he said. "There was never no contention about it until this last two or three years, and then this year a man went up and stole it. "There are 13 banners up in the village at the moment showing different groups and associations, and they keep picking on this one because it's of Wesley. "He is up there because Moygashel people think he should go up there, and that's that. "They put it up every year out of respect for the man. "People want it up to commemorate what he did and what happened. "But someone came out and stole it and the police have taken it away. It's just a joke." Mr McNicholl said members of his community were offended by IRA murals in nearby Dungannon, but that they "wouldn't attack them". "Why are people getting annoyed about this one banner when they have an IRA mural down the road?" he said. "That's what we all think in Moygashel. I lost a cousin to the IRA. I lost friends to the IRA who I served with in the armed forces and I have to drive past that mural to the IRA all the time. "If I drive towards Dungannon, the first thing I see is the hunger strikers looking at me from the side of a house all-year round and I don't like it. But I don't go down and steal or destroy it. "It might offend me but I do not get out of my car and throw stones or bottles at it, or tell the people it shouldn't be there. I just let it stay there. "The people of Moygashel don't bother anybody, but once a year this whole thing flares up. It's just stupid sectarianism." Yesterday Stephen Travers, who survived the Miami Showband massacre in which three of his bandmates were murdered, said that any glorification of violence was "not good for society". "If that's how the people of Moygashel want to be represented, then I won't tell them what to do," he said. "It never offended me, I thought it was a bit sad." The PSNI said: "The poster is currently being held as evidence in relation to the ongoing investigation."